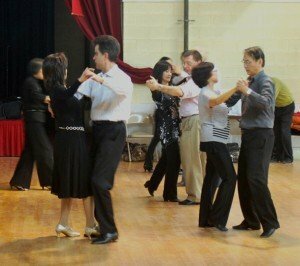 Great essay on dancing – how wonderful for you to take that class with your father and brother. Dancing is great exercise and so much fun, especially when you don’t get caught up in having to be perfect. My hubby and I love to go to the Crystal Palace on Thursday nights. It’s live music and not usually as crowded as the weekends. We don’t officially know the 2-step, but we watch others that do and follow along. Dancing is a way to get off the couch, get out in the community, and have a good time with your partner. See you on the dance floor! We want to make it out to the Crystal Palace some night. Maybe we’ll see you out there! Good for you on dancing each week. My mom and I started line dancing at the Rasmussen Center after my father passed away. We would go once a week. It was so nice to be out and doing something different. Your dad sounds like he was a really cool guy… thanks for sharing. We took some lessons at Rassmussen. It is a great community resource. Our instructor was Bob Watts and he was a lot of fun. I appreciate your honest confession of your experiences with dancing. I am personally sound deaf so I don’t know how to count properly when dancing. I learned how to swing dance in high school but I never could get the hang of it although I had lots of fun. I agree that it beats yoga for exercise!